We’re on our way back from Disney World, where I was inspired by all the sweet treats. Rather than list them all, for now I will tell you my absolute favorite so far — The German Chocolate Chip Cookie from Goofy’s Candy Company in Downtown Disney. 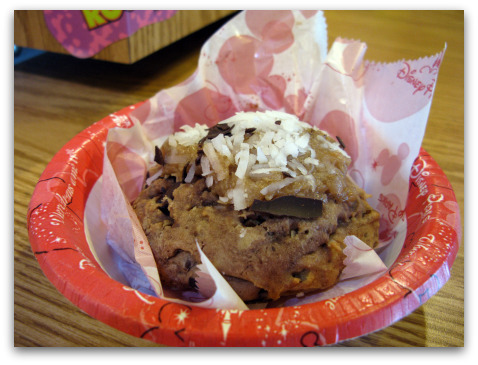 I knew from prior cookie searches that Goofy’s often carries some terrific baked goods. Next to Writers’ Stop and Starring Rolls Cafe in Disney Studios, Goofy’s Candy Company is my third favorite spot for cookies. So I knew I’d find something good, but I underestimated just how good that cookie would be. Like the other cookies in Goofy’s Candy Company, the German Chocolate Chip cookie is a huge, fat cookie big enough to share between two or three people….not that you have to. Along with being oversized, they look kind of rough and dry. A skeptic might think they are better looking than tasting, but if you get one fresh as I must have done today, you will be rewarded with a dry-shelled, tender and soft, slightly underbaked on the inside cookie packed with flavor. In this cookie’s case, there was a light chocolate flavor, big chunks of chocolate chips, brown sugar, and a topping designed to mimic what you get on a German Chocolate Cake, but richer and less sweet. I believe that at one point the Disney Cookies were provided by Las Vegas based Selma’s, but I’m not sure they are anymore. Aside from the Rice Krispy treats which carry the Selma’s logo, most of the cookies are just branded Disney, if at all. So if you find yourself in Goofy’s Candy Company, think “cookies” and not just candy. And let me know what you think. In the meantime, I’ll be posting a clone recipe for the German Chocolate Chip Cookie. A friend and CM reader who liked the cookies as much as I did, developed one recently and now I can’t wait to try her recipe. Betty, I never got the Disney one right. Still trying. Have you ever put a German Chocolate Chip Cookie clone recipe on the site? I looked for one but didn’t find it. I’d love to try making them. we just returned from disney world(october 11th)in orlando, florida. tried this cookie at magic kingdom (the bakery as soon as you walk into the park) and then again at down town disney. we asked an associate at the goofy candy co. how they make them and they said that they get them fresh every single morning from selma’s. they said that you can order them and they ship internationally (selma’s). i wasn’t able to find them on the website, and their phone number doesn’t work from canada, so I’ve tried emailing to see if i can special order them. has anyone had any luck ordering these? i want to get them for my husband’s birthday! Does anyone know when the recipe will be posted or if it already has, where I can find it? The density of the cookies are almost cake-like, not just plain cookie texture. Most of the chefs at Disney will give you their recipes; so I wonder if either a) Disney has the recipe, or b) Selma’s cookies will give the recipe since they are not sold on their website…worth a shot. Wow, Judging from the size, it almost looks like a Levain cookie clone topped off with German chocolate cake topping. Was the inside cookie-dough gooey like the Levain cookie? My favorite German chocolate cake filling is from “Inside out German Chocolate Cake,” an old recipe from Gourmet, but still available on Epicurious. It uses Dulce de Leche for the base, with pecans & toasted coconut mixed in. The original recipe makes the Dulce de Leche from scratch, but it’s so much faster to just buy it already made, and just as good, in my opinion. Nick, yes — they are Selma’s….as are all the Minnie’s kitchen cookies. I spent today trying out various clones. OMG. I’ve never seen those at Disney. I’ll have to look the next time we go. I can’t wait for the copcat recipe. Anna, when I was there in May 2010, they were still being sold as Selma’s GCCC, along with the Carrot Cake Cookies. Have been trying to replicate the recipe, but to no avail. Returning in September to see if anyone at WDW has the recipe. Katherine, Janice already did! I’m going to buy the ingredients and give it a try. Karen, no we didn’t. We only went to Magic Kingdom, Epcot, Disney Studios and Downtown Disney. We’ll have to see the HP park on our next vision. Can’t wait to hear about the trip – Did you go to the Harry Potter park???? Oh this looks sooo good! Think you can create a copycat?! My husband’s favorite cake is German Chocolate, so I’d love to try to make these cookies! Can’t wait for a clone recipe! I just went to AJ’s Disney Food Blog and that cookie looks incredible. I hope Janice shares her recipe here!! That looks like an awesome cookie! I’m glad to hear that you had a good trip. Can’t wait to hear how Fuzz’s friend the vegan fared, and to read about your GCC clone! That cookie looks WONDERFUL, I can not wait to see the recipe. German Chocolate cake is my favorite. Please post the recipe as soon as you get it and try it out! When we were in SF with Rina, at Elizabeth Faulkner’s place, wasn’t there a German chocolate chip cookie there? I think I bought one. Then I left the cookies I bought in her car. Sigh. WOW! That is an awesome cookie! Can’t wait to see the clone recipe! I’ve never been to Disney World but have always wanted to! I think I’d go just for the cookies and treats alone :). oooh, these cookies sound amazing! I would have never thought to do that ~ that Goofy’s a genius! Ali, I need to do some more research and see if the cookies are still made by Selma’s or if Disney makes them at their own bakery. They are so good. What I have noticed is that they are better when fresh. This looks phenomenal! I just went to the Disney Food blog where there were several photos of the cookie sliced open. This is my kind of cookie when I’m in the mood to indulge, and I can’t wait to see your clone. We just got back from Disney and my husband got one of those cookies in the Main Street Bakery in Magic Kingdom. I was skeptical, but it tasted fantastic. Not dry at all. Can’t wait to see the recipe you’ve come up with! Janice, what chocolate chip cooke recipe do you use? Anna, I just teared up a little that was my favorite cookie when lived in Orlando (now I am in San Antonio). I am happy to hear that they sell it other places besides Germany at Epcot. Janice, thanks for suggesting the German Chocolate Chip Cookie. I might not have tried it otherwise. It was a fun trip! I am a little anxious to get back to my kitchen, though. I’ll be very interested in trying the GCCC clone. I’ll never have the real thing, but I can still decide if it’s a good or bad cookie. And I’m looking forward to a trip report and photos. I almost leapt through my screen! Now I have to go downstairs and make a batch!! BTW, I mad a batch of ANZACS using Sahale Snacks Sing Buri mix and they are so tasty! Can’t wait to hear about the trip AND the food! !